The tram runs on hydrogen power via on-board fuel cells. Refuelling takes just three minutes, after which a three-car tram capable of carrying as many as 380 passengers can run for about 100 kilometres. This is the FIRST in the world. It resembles an high-speed bullet train, at least until it moves. It’s a tram, not a train (top speed at about 70 km/h), but in the smog-choked China speed’s not as important as what the new tram leaves behind it: its only emission is water. The tram runs on hydrogen power via on-board fuel cells. Refuelling takes just three minutes, after which a three-car tram capable of carrying as many as 380 passengers can run for about 100 kilometres. There’s an obvious problem facing the future of hydrogen-powered transit. Across China’s vast expanse are only about 83 miles of tram tracks, laid out in just seven cities. 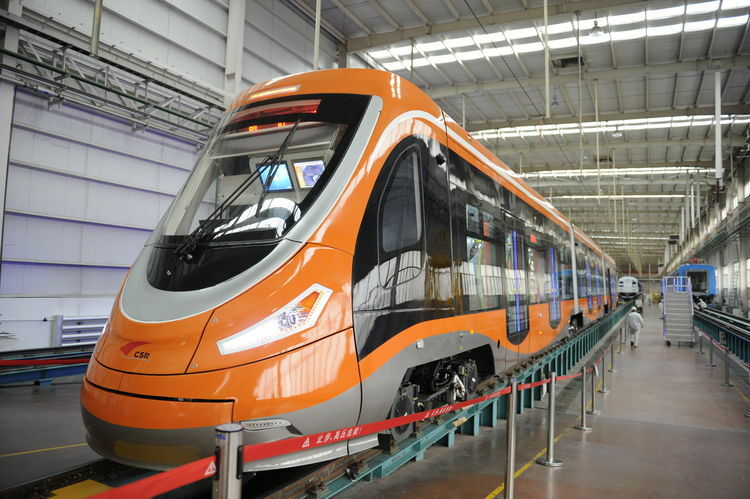 Still, for the state-owned manufacturer behind the tram, Qingdao Sifang Co., there’s reason for optimism. Chinese officials intend to bet big on the tram technology. Plans call for spending €29 billion over the next five years to increase tram tracks more than tenfold, to more than 2000 kilometres, and to buy more trams, according to the Xinhua state news agency. Sifang also makes more traditional trams that connect to overhead cables or carry batteries. One early adopter is Foshan, a city of 8 million in southern China’s Guangdong province, where officials say construction of new tram lines could start later this year. Foshan is getting heavily into hydrogen transit. Last year the city invested €68 million in a plan with Sifang to manufacture the trams locally for nationwide distribution. The two sides also have agreed to create a national hydrogen-power research center. Foshan’s commitment to clean energy appears to extend beyond hydrogen. A report in the official Foshan Daily said the city will also work with SAIC Motor, China’s largest automaker, to produce parts for fuel-cell cars. An SAIC spokesman declined to comment on that report, and any collaboration on fuel-cell cars may be relatively far from fruition. Last year the company said its goal was to advance hybrid and electric models, while keeping fuel-cell vehicles in research and test runs. So far, Toyota is the only automaker to roll out a hydrogen car, the Mirai sedan, which is expected to go on sale in the U.S. later this year. “Toyota’s investment in hydrogen far exceeds any of its Chinese counterparts,” says Xu Sichuan, a professor at Tongji University’s School of Automotive Studies.